In 1946 or 1947—no one knows for certain—a Bedouin goatherd nicknamed Muhammad the Wolf led his flock around the cliffs lining the northwest edge of the Dead Sea. As the livestock grazed on sparse vegetation, Muhammad wandered around the boulders. According to one of several variants of the account, he hurled a stone into a cave to startle a stray goat and heard pottery shatter. Too frightened to lower himself into the cave alone, he returned several days later with at least two relatives from his Ta’amireh tribe. Though they fantasized about finding gold and silver, instead they stumbled upon a cache of oddly shaped clay vessels with bowl shaped lids. Inside one jar, they discovered three ancient leather scrolls, intact and wrapped in linen. The Bedouin carted their scrolls back to their camp. The tribesmen stored the bundle in a goat skin bag and hung it from a tent pole. Unfamiliar with the aged script, they debated whether they should repurpose the old strips of leather. Fortuitously, Muhammad’s uncle thought to take the scrolls to Bethlehem on market day. Their first foray into the black-market antiquities trade aroused more suspicion than success. One trader sent them on to the next. In the end, they arranged for a Syrian Orthodox merchant, Khalil Eskander Shahin, known as Kando, to sell the scrolls for a commission. Kando owned a general store and cobbler shop near the Church of the Nativity. Archbishop Mar Samuel, head of the Syrian Orthodox Monastery of St. Mark, made the purchase soon after he saw the scrolls in Kando’s possession. As the former librarian at St. Catherine’s Monastery at Mt. Sinai, the Archbishop had experience with ancient scripts. 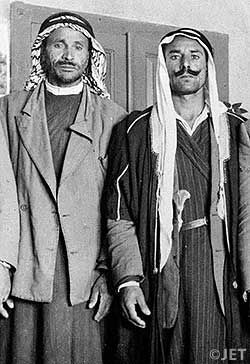 Once Kando took out his commission, the Bedouin returned to the desert the equivalent of sixty dollars richer. Hoping for an even greater return on his investment, Muhammad the Wolf’s relative returned to the cave and retrieved four additional scrolls. Again, one of the scrolls found its way to Kando. The other three scrolls were sold to an antiquities dealer in Bethlehem, Faidi Salahi. Salahi intended to put the scrolls in front of a Hebrew scholar capable of realizing their full worth.